Autumn provides ideal conditions to drift-fish for blue catfish in big lakes and reservoirs. Schools of these big whiskered brutes become scattered and more difficult to find as days grow shorter and water temperatures fall. Drift-fishing with multiple poles and baited lines can help narrow the search for them quickly. 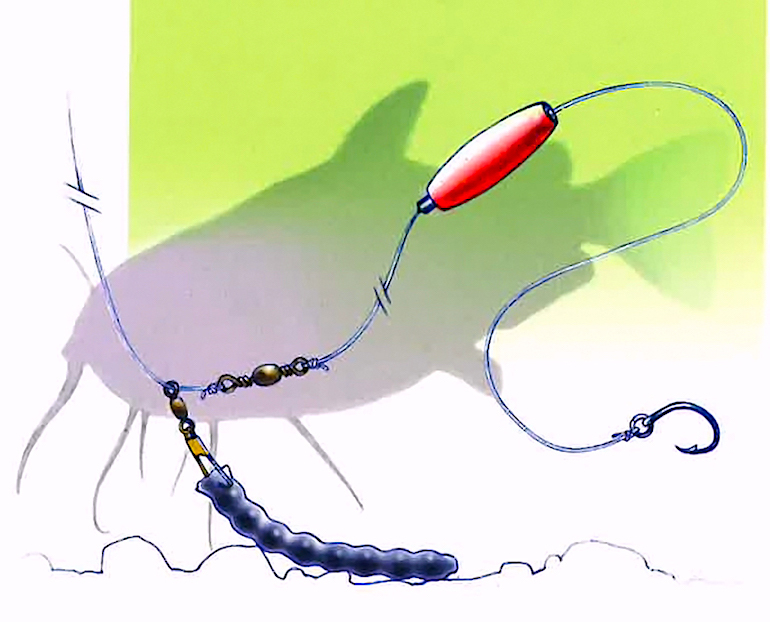 What may be the perfect rig for drift-fishing was shared with me several years ago by Texas catfish guide Randle Hall. At the time, Hall was guiding on several big reservoirs in the Dallas area, and he had spent long hours perfecting a rig that would help his clients hook and land more heavyweight blues. 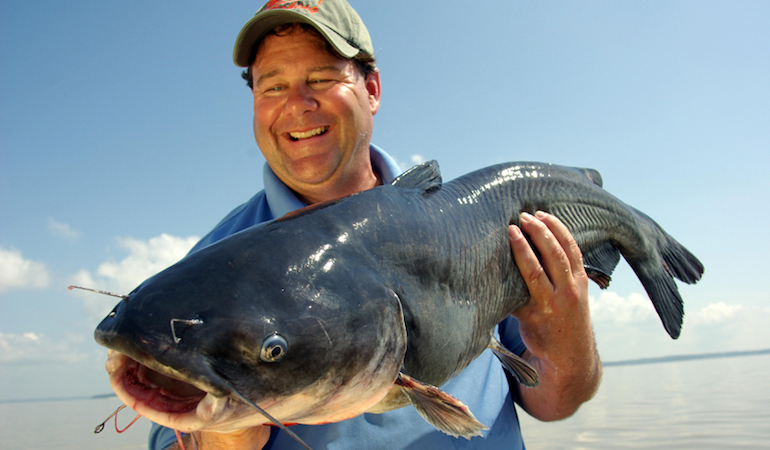 At the time, his customers held four lake records for blue catfish in 29,592-acre Lake Lewisville, proof that this cat man was onto something. The split ring is attached to the eye of the hook,” said Hall. “Then I put two drops of Liquid Weld on the split ring so it holds together. The split ring is tied to the leader with a Palomar knot. I put the crappie cork on the leader about 10 inches above the hook and ring. The other end of the leader is tied to the barrel swivel. The effectiveness of this rig becomes apparent when one examines Hall’s reasoning in its construction. First, the use of a circle hook alleviates the need for Hall’s customers, often inexperienced fishermen, to grab a rod from a holder and attempt to get an effective hookset. The split ring allows the baited hook to swivel, a fact Hall credits for better hook penetration. The Snake Weight is relatively snagless, making it ideal for drift-fishing, and when the rig moves across the bottom, the crappie cork keeps the baited end floating in the strike zone. Hall’s experiments with baits led to equally innovative choices. Cut shad, an old standard for blue cats, was one of his favorites, but he also used squid and strip baits made from buffalo, carp and bonito. When using carp, buffalo or bonito, Hall scaled and filleted the fish, then cut the fillets into triangular pieces 3/8- to 1/2-inch thick, 3 to 4 inches long, and 1-1/2 to 2 inches across on the wide end.